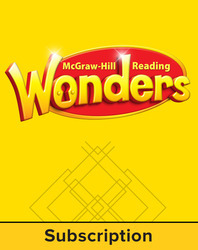 Start your students on the path to College and Career Readiness with Wonders for Kindergarten. The systems contains all core instructional materials and offers engaging literature with all the support you need. Complete system includes: Reading/Writing Workshop Collection (11 titles, 6 copies ea. ); Reading/Writing Workshop Big Book Package (11 titles, 1 copy ea. ); Literature Big Book Package (30 literature titles, plus Alphabet- and Rhymes Big Books--32 titles, 1 copy ea. ); Teacher's Edition Package (1 ea. of 10 volumes); Leveled Readers (30 titles, 6 of ea. ); Your Turn Practice Book; Large Sound-Spelling Cards; Interactive Read-Aloud Cards; High-Frequency Word Cards; Photo Cards; Reading Response Boards (set of 6); Teaching Posters; Visual Vocabulary Cards; Unit Assessments; Benchmark Assessments, and more!